Is the English Defense League a Genuine Anti-Islamist Force? The English Defense League (EDL), a street-protest movement in Britain, purports to be fighting against Islamism in the UK, but is this actually the case? The question of which groups or people one works with among self-described "anti-Islamists" or "counter-jihadists" is often vexing. Many EDL supporters, for example, do not even live in the UK. "…the EDL is standing up for human rights, for the freedom of speech, for Western civilization, for Israel, and for the defense against the global jihad and the Islamization of Britain. There is no credible evidence that this group is racist or fascist in the slightest degree. And it is standing as a virtually unarmed David against a Goliath of the British establishment, government, media, and police muscle. They are being vilified and smeared as well as brutalized and railroaded. Yes, it has come to this, and it has come to this quickly, and all free people who are in the U.S. and elsewhere should take careful note, because it is happening quickly here as well. The EDL deserves the support of all free people." Although EDL sympathisers understandably like those who seem to share similar anti-jihadist leanings, they normally overlook a few problems: mainly the nature of many of the people who belong to the EDL. The EDL is a group with substantial numbers of "football (soccer) hooligans" in its rank-and-file: namely, fans, often part of organized gangs known as "firms," who travel to various grounds to stir up fights and commit acts of vandalism. 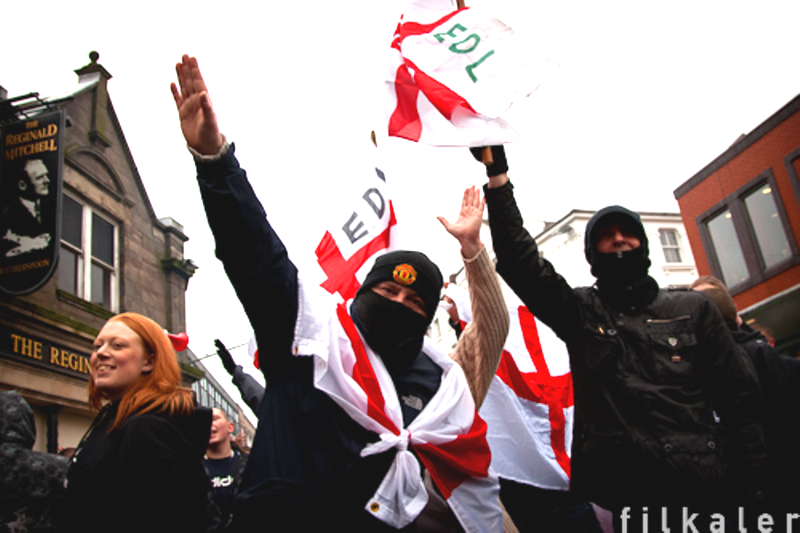 EDL members give Nazi salutes on video and in photographs at rallies. In one video of an EDL march in Leicester, supporters attack an Asian-owned takeaway known as "Big John's," filled with innocent families; EDL members can be seen charging into the restaurant until the police are called. In another video, EDL supporters try to break into a café on Granby Street, Leicester. In addition, members of the EDL's Birmingham-division were photographed expressing their admiration and support for anti-Catholic, Ulster loyalist groups such as the Ulster Volunteer Force (a proscribed terrorist group that not only aims to keep Northern Ireland a part of the UK, but also desires to resurrect and enforce a model of Protestant supremacism there). In 1999, Journalist Donal Macintyre made a BBC undercover documentary, focusing on a football hooligan firm known as the Chelsea Headhunters; the film exposed the Headhunters' support for neo-Nazism and militant Ulster loyalism, as well as their intentions to stir up violence against rival football fans at Chelsea matches. It is not surprising, therefore, that the EDL, given its extensive ties to football hooliganism, has so many far-right extremists in its ranks. The EDL leader's admiration for football hooliganism is also apparent in his use of his pseudonym "Tommy Robinson," the name of a man who became notorious for leading a football hooligan firm in the EDL leader's hometown, Luton. In response to these findings, EDL admirers frequently claim that the EDL's policy is to expel football hooligans and other dubious individuals. These defenses are precisely the ones used by the largely neo-fascist British National Party (BNP) whenever its leader, Nick Griffin, is confronted over the presence of questionable individuals in his organization. Yet many EDL defenders do not take Nick Griffin at his word -- that the BNP is merely a force standing up against Islamisation that expels all racists and neo-Nazis from its ranks. Why, then, is there what looks like a double standard: a rush to take the EDL at its word? "the muzzies wanna keep away from me im just looking for an excuse im f******d off at the mo f**k the pakis … i just think we shud burn the c**ts now!! "Be careful if you go out driving today… driving conditions are awful, ive just come off the road and hit a muslim!! It took me 10 minutes, 2 fields and a golf course, but I got the f*****r!! "Hes one of the greatest naturalist of all times, searched the world and showed the british public animals and plants from across the world through the aid of television, and I congratulate him on his retirement, but please before you do retire sir richard attenborough [sic], any chance you can find me a moderate muslim????" Mr. Singh, when first asked about these postings, never denied writing them, but asserted that he had been subjected to death threats from Islamists. Likewise, a British defender of the EDL by the pseudonym of "Esmerelda Weatherwax" asked me to understand Singh's anti-Muslim bigotry in light of "prejudice against Sikhs." To see the absurdity of such apologetics, substitute the word "Jew" for "Muslim" and imagine an innocent Palestinian who has been intimidated and abused by an extremist Israeli settler like Baruch Marzel, who is by no means representative of those living in the suburbs in the West Bank. Would this hypothetical Palestinian's remarks be any more "understandable" to Esmerelda Weatherwax? Of course not, and rightly so. The question moreover arises of why Amit Singh is even still in the EDL if the group has a policy of expelling bigots. Regarding the EDL's apparent support for Israel, it should be noted that its declared advocacy for Israel is a tactic increasingly being employed by far-right parties across Europe to attract Jewish support and to conceal the far-right parties' anti-Semitic pasts. "A friend of mine went with a dozen of his mates … the EDL battered f*** out of The Ethnics. He said he never saw any ethnics with the EDL and him and the 2 or 3 thousand there couldn't give a f*** about Israel or Zionism and all they care about is beating up ethnics and Muslims in particular." "F** all those who shout Zionist sympathisers and all the rest of it. For the vast majority it just isn't about this…..it's about making a stand against an aggressive invader who has seriously abused the indigenous people of these Isles." "In those so-called freedom centres, they plot to destroy and kill us. We're still waiting for the Muslims to make peace with each other. They eat each other alive, like the dogs that they are...' (author's emphasis)." As for the EDL's Jewish division, one can begin by observing that the BNP has token Jewish members and supporters too: notably a member called Patricia Richardson who served on the Epping Forest District Council. Richardson defends the BNP from charges of racism, affirming that it is the best party in Britain for combating Al-Qa'eda. Yet concerning the EDL, Mark Gardner firstly points out that the Jewish branch is only a small part of a far larger movement. Nonetheless, it should also be noted that the Jewish division has now forged ties with the Jewish Task Force, headed by convicted terrorist Chaim ben Pesach (also known as Victor Vancier). Vancier is banned from Israel because of his support for, and involvement in, the proscribed Kahanist political party, Kach, classified as a terrorist organisation by the United States. To be fair, a few EDL supporters on the group's internet forum were horrified about this alliance because of Vancier's terrorist past (not necessarily because of his Kahanist and far-right beliefs). Consequently, some of the EDL leadership threatened to sever links with and disband the Jewish division. Yet the present situation remains unclear: the EDL's Jewish division still maintains an active Facebook page, with neither side announcing a formal end of relations. If EDL apologists did a fraction of the research they do on Islamic theology, all of this would be apparent to them. Three possible conclusions arise: they are (i) simply unaware of the extremism in the EDL, (ii) they know about it but conceal it on the principle of "the enemy's enemy is my friend," or (iii) they share the bigoted beliefs that predominate in the EDL. Can anyone who professes to oppose Islamism in the name of defending human rights really support a group like the EDL? None of this is to approve of the "Unite Against Fascism's" (UAF, which recently ended its association with another anti-fascist group called "Hope not Hate" for criticizing the UAF's links to the pro-Islamist Socialist Workers' Party) confrontational methods against the EDL, or to say that all members of the EDL are racists and bigots. Rather, it is clear, from the evidence above, that the EDL is an organization that all genuine anti-Islamists would do well to steer clear of, if not denounce; and from which they should probably disassociate themselves. The trends of neo-Nazism, Ulster loyalism and football hooliganism are far too prevalent for the group to be worth aligning with in any way. One should probably also never assume that someone professing to oppose Islamism is an ally solely because of an alleged antipathy towards Islamist ideology, or opposition to Islamism risks being hijacked by far-right extremists -- and genuine anti-Islamism, that seeks to uphold the liberal-democratic values of Western Europe and the U.S., risks become a discredited force. Once a mosque is built, there is no way of controlling what goes on inside it. Yet the Freiheit party probably brings forth a better starting point on how Europeans and other non-Muslims should respond to the presence of Islamism in their own countries.